According to the Internet source given below, Michael Posch is an Austrian recorder player born in 1969 in Klagenfurt. 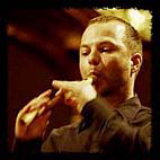 He studied recorder at the "Kärntner Landeskonservatorium" and the music academies of Vienna and Trossingen, Germany (D) and has completed master -classes with Frans Brüggen and Walter van Hauwe . He has been the director of the ensemble "Unicorn" since 1991 and has performed throughout Europe, Canada, Taiwan, and the Middle-East. He also participated in Baroque opera projects with N. Harnoncourt and as an interpreter of contemporary recorder music with the "Österreichischen Kammersymphoniker". He leads the department of Early music at the Conservatory of Vienna. Photo: Willi Schuehle courtesy Naxos.